It is a calm period before the waters warm, the oysters become active and our coasts begin bustling with people enjoying the beautiful waters. Yet it is not a period of inactivity. Nantucket is preparing for its Summer of shell recylcing. Brewster is also starting a program. 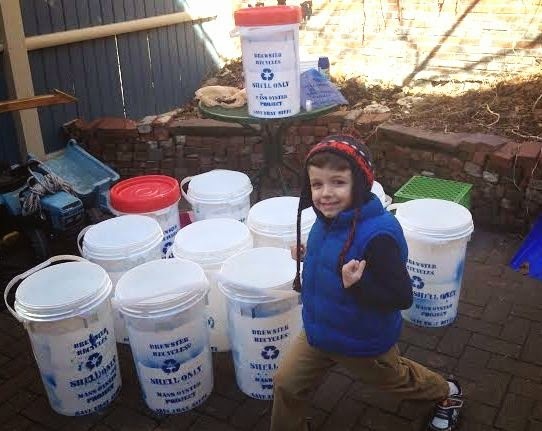 Mass Oyster is working with Charlestown, Mass recycling company Save-That-Stuff to supply Brewster with recycled buckets. Oyster shell recycling buckets set to be delivered to Brewster. If you want to help- here are four ways. 1. We need to get these buckets from Boston to Main Street in Brewster. Email massoyster.org if you have room in your car for two stacks of buckets and a stack of lids. Its about the equivalent of a person and a half of space in your car. 2. We need more participating restaurants. If you frequently consume oysters when you dine out- we can send you leave behind cards to encourage the chef/manager to join our program. email massoyster@gmail.com and we will forward you some. 3. Do you have time and a car to drive and pick-up shell on a regular basis? One of our volunteer drivers has a scheduling challenge so we could use more help. 4. Frequent the Boston Langham Hotel who has been a keystone participant to our shell-recyling program. Tell them you heard about their terrific Sunday Brunch here. Below is an article about a program starting in Stuart Florida. We highlight it because it is well written and highlights the participating restaurants. Mark Perry, executive director of Florida Oceanographic Society, along with Vincent Encomio, PhD, director of scientific research, have partnered with City of Stuart Mayor Troy McDonald, Mary Kindel (recycling and conservation coordinator) and Cheryl Miller (designer and GIS/LIS coordinator) to recycle oyster shell and restore important oyster habitat in the St. Lucie River Estuary. This recycling and restoration program leads to long-term and significant ecological improvements to the health of our estuary and provides additional recreational and economic benefits to our community. STUART — Oysters are a delicacy for many, but they also play an important role in cleansing our estuary. A single oyster can filter between 20 and 50 gallons of water per day. That’s why the City of Stuart is proud to announce its new partnership with Florida Oceanographic Society in the Treasure Coast Shell Recycling Program. This regional program initiated by Florida Oceanographic provides a valuable service by collecting discarded oyster, clam and mussel shells, recycling them, then deploying the shell into the estuary to provide a habitat for new oysters. Vincent Encomio, PhD, director of scientific research at Florida Oceanographic, spearheads this effort to restore the oyster population in the St. Lucie River Estuary and Indian River Lagoon. Participating local restaurants receive collection buckets, along with drink coasters and bookmarks to accompany customer checks. These materials help increase public awareness of the program and illustrate the importance of oyster restoration for a healthy river. The oyster shells are collected by Florida Oceanographic each week and brought to the Coastal Center to be quarantined for three or more months. After the required isolation period, the shells are bagged with the help of volunteers and strategically deployed in the estuary. This project helps to restore important oyster habitat, leading to long-term and significant ecological improvements to the health of the river, as well as providing additional recreational and economic benefits to our community. To learn more about the Treasure Coast Shell Recycling and Florida Oceanographic Oyster Restoration programs, visit http://CityofStuart.us or http://FloridaOcean.org.